Guess what I’ve been doing all day? My little tomato-munching monster stands ready to jump in the second she thinks I’m not looking and start poking holes in their shiny, tender skins. She is more of a threat to my tomato harvest than an army of hornworms or a flock of chickens. Daily she left behind juicy, seedy piles of devastation on my porch last year. Ava doesn’t get sick of them. She could eat four or five at a stretch. Last year I made some good salsa using the Mrs. Wages’ spice packets. At nearly $3.00 a packet, I didn’t find that very economical though, so this year I tried to grow most of the ingredients myself. I used the Ball Blue Book recipe for Zesty Salsa, but after spending all day chopping vegetables I am not really happy with the results. It came out with way more onion and pepper than I’d like. And also hotter than I like. I have a few ideas where I might be able to tweak it–which tomato types to use and definitely less Hungarian Hot Wax Peppers or maybe use a chili pepper next year. You can use less peppers/onions than called for, but certainly not more. 😛 I’ll find some use for it either way. Maybe it would be good in chili…or to marinate a roast. I moved everything out onto the porch, which frees up a lot of counter space and keeps the kitchen from getting quite so hot. I bought two 6′ x 2.5′ folding tables at Ollie’s for $35 each. They’ll be handy for a number of things…cookouts, yardsales, butchering chickens. And I also bought a Coleman Outdoor Grill and Stove which is a really useful thing to have. When I decided to get a new ceramic cooktop stove, I realized I couldn’t use my waterbath canner on it without risk of damaging it because the bottom of the canner is fluted and wouldn’t make for good heat conductivity and the heavy weight of it could crack or scatch the stove. I’ve wanted a camp stove for a while anyway. 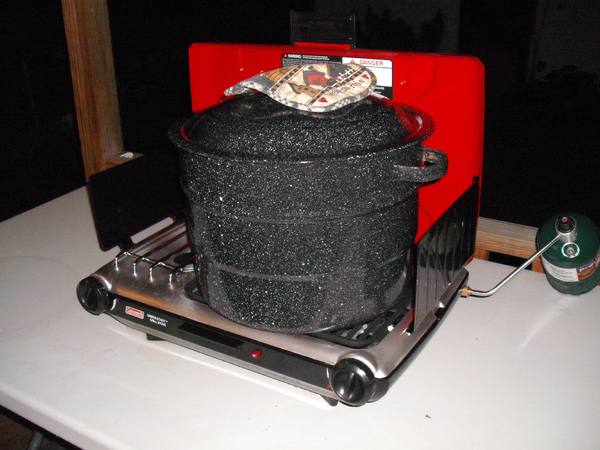 It will also be useful for butchering chickens to boil the scalding pot and also a good thing to have on hand if the power goes out or for going camping (if I can ever talk my husband into going tent camping again). This set-up worked really well and was very efficient. I like that my kitchen is not so cluttered and I don’t have to work around rows of jars that must sit undisturbed for a day. 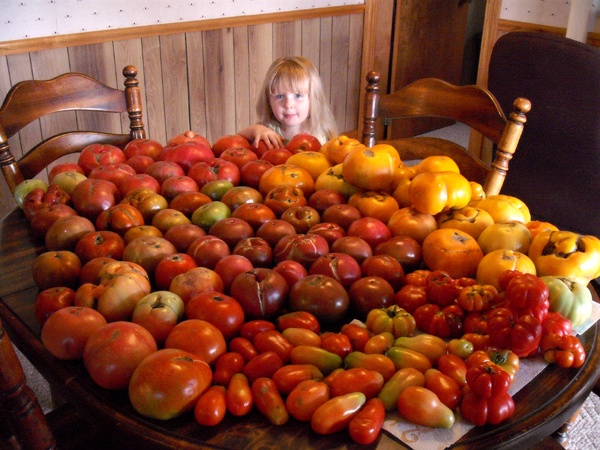 I’ve had a pretty good harvest so far and I have many days of canning ahead of me yet. 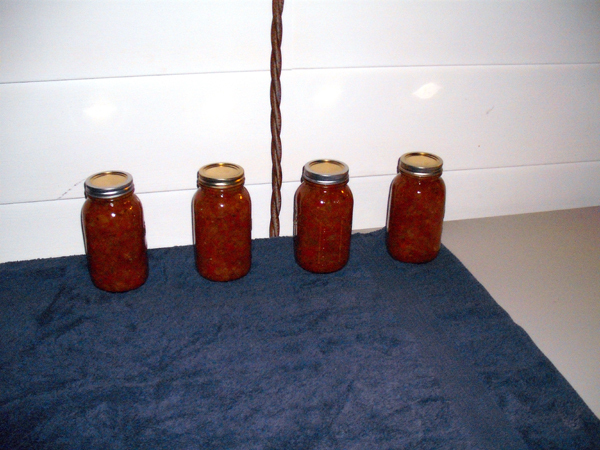 Today I’ll work on finishing up the rest of the tomatoes as plain canned tomatoes, which is pretty easy. Then I’ll move on to making Hot Pepper Mustard (Butter) which is mostly for my Dad because he really loves it. I made sauerkraut a couple days ago out of a dozen cabbages that I just harvested and it still has a few weeks of fermenting in the jar, then I’ll can it. I froze my blackberries for now, waiting until I had enough to do several batches of jam. Then it’s on to apple sauce, juice and jelly…and somewhere along the way I’ve got to find some place to buy a couple bushels of peaches because ours didn’t do well this year (mildew/disease). Here’s what’s left of my storage onions after making salsa. That should get me to November perhaps. I planted a lot, but seemed to use them daily right from the garden once they started to get up to size. The reds aren’t good keepers. They were very determined to flower, which messes up the integrity of the bulb even if you do pinch them off. 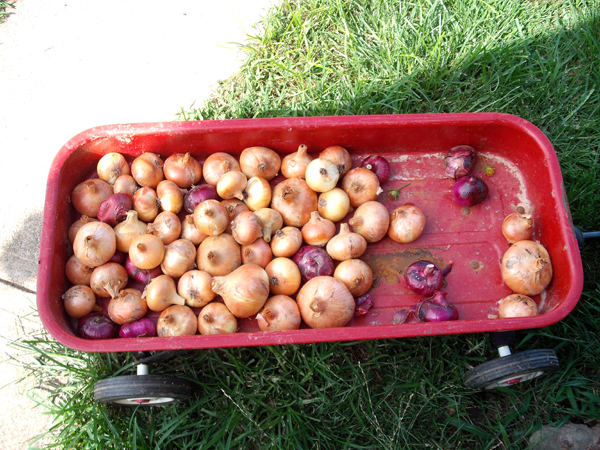 This was the first year I did well with onions because I actually took the time to study up on when and how to plant them this time. The earlier the better! I planted five vines on the spot where I had penned my Cornish X broilers last year and they LOVED IT. 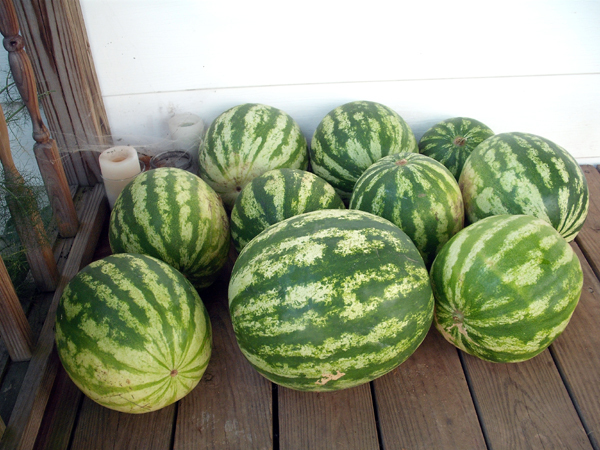 I harvested 17 Crimson Sweet watermelons so far, two were huge–over 20 lbs each and most of the rest were 15 lbs! Unfortunately with canteloupe and watermelon, they all seem to turn ripe at the same time, so I’ve been giving a bunch away. As with the tomatoes, you can only eat so much watermelon…then you’re done!